Eaton Posi prevents wheel slip before it can get started. To do that, carbon disc clutch packs, preloaded by a central spring assembly, are located behind each differential side gear. 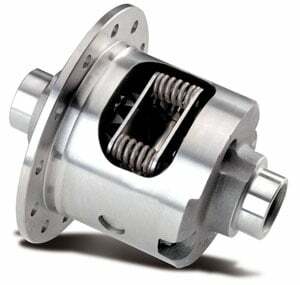 When torque input increases, clamping load on the clutch packs increases. That causes the chatter-free clutch packs to grab and transfer power to the other wheel. Eaton Posi units are rebuildable. Muscle cars, hot rods and mild off-road vehicles should look to Eaton's limited-slip differential for their traction answers. And the fact is, Eaton's Posi units are virtually bulletproof. Note: Please read the more details section as some differentials require special bearings which are not included. JEGS Easy Kits are designed by JEGS Professionals to assist your shopping experience. 19587-010 is rated 5.0 out of 5 by 1.